St. Mihiel - Feb. 8. 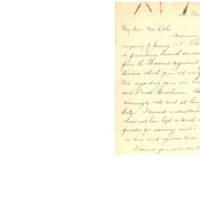 Answering your inquiry of January 14th I take pleasure in forwarding herewith from the Personel Adjutant of the 79th Division which gives all needful information regarding your son Lieut Ochs and Private Branham. Both are [?] well and at their ports of duty. I cannot understand why they should not have kept in touch with their families for incoming mail is now arriving in due and regular time. I recall you and Mrs. Ochs very well indeed and the pleasant year we spent at the Clinton. Kuhn, Joseph E., “Scrapbook page 87,” 1918 February 8, T100560, Adolph S. Ochs Jr. Collection, Woodrow Wilson Presidential Library & Museum, Staunton, Virginia.